Note the bread in his hand. 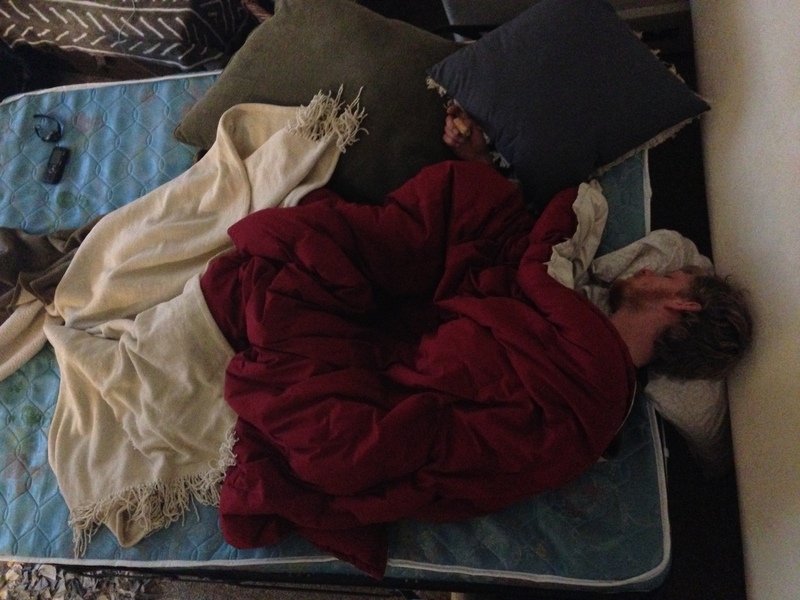 A few weeks ago, I was sleeping on a pullout couch in my friend’s apartment in Seal Beach, California next to my best friend Dave. He woke up around six to go for a long run, and sometime after he left, I got up to read my Bible. After Dave had been gone for about two hours, I was quietly sitting there reading when he burst through the door. He stumbled through the small apartment like a madman. He was a hunched over zombie, scrounging for fresh flesh. He grabbed some peanut butter and began throwing it on a decrepit piece of bread. “I’m about to pass out,” he whispered between breaths. “No,” he muttered, barely audible. “Food first. Sustenance.” With that, he collapsed onto the ground in the kitchen, leaning against a cabinet limply lifting his PB bread to his lips. He was shaking and turning blue. I walked to the sink and poured him a cup of water, which he couldn’t lift from the linoleum floor. I made him another piece of PB bread after he finished the first, and he slowly started eating it. Eventually, I lifted him to the pullout bed, covered him in a comforter, and he continued listlessly nibbling on his bread beneath it all. After I thought he was asleep, I went to take the half-eaten bread from his outstretched hand, but he softly stopped me. “Put it back,” he murmured, and I placed it back in his statue of a hand. Now, I am the type of friend that finds this kind of thing funny. I knew Dave to be a might dramatic from time to time, so I was not worried quite yet. A few minutes later, Kenzie came out of the bedroom and asked where Dave was. I pointed to the bed with masses of blankets and sheets on it. “He’s under there,” I said. The poor guy’s frame didn’t even make a lump beneath the comforter which probably weighed twice as much as him. A few minutes after, Tressa emerged from the bedroom. “Where’s Dave?” she asked. I pointed to the unmoving mound on the bed. After Dave had slept for an hour, Hillary returned from her practice. She had brought Dave orange juice to help him recover. “So where’s Dave?” she inquired. I laughed and climbed next to Dave on the bed and gently shook him. As he opened his eyes, he looked puzzled. “Ethan…..” he muttered, “is there a sandwich in my hand?” I laughed harder. It turned out that he remembered nothing from the morning. He remembered leaving for his run, but about halfway through, he lost all recollection and has no idea how he got back to the apartment. He doesn’t remember bursting through the door or making himself a PB slice. He began gently nursing his bottle of OJ, and Hillary and I tried to piece together the morning he had had. Somehow, in his mindlessly ill state, Dave had wound up with two packets of butter in his shorts. He does not know why. He does not know where. He does not know how. All we know is that he came back from his run and then fell asleep with two half-melted packets of butter in his shorts. We are still laughing about that one. That story has nothing to do with anything, but I also want to write about something that has been on my mind: this blog. No one is a stranger to the barrage of opinionated articles and biased reports that flow like trout down the stream which is Facebook. Many are good and true, and I agree with them. Many condemn homosexuals, and many do not condone gun laws. Many are in favor of homosexuals and want nothing to do with weaponry. Many want less God, more science; and many want less bicycles, more tricycles (they’re greener). I want to clarify the purpose of my blog, and maybe answer some unspoken questions some of you may have. I have not written about abortion, homosexuality, alcohol, weed, or anything that deserves a discussion instead of a blog post. I like the way Pastor Carl Lentz put it in an interview with Katie Couric, after being pressed to speak about homosexuality: “We have a stance on love…and everything else, we have conversations about.” There are things that are sensitive to so many people, and a sweeping article of generalizations and finger pointing is not beneficial. I don’t think that’s how Jesus would have approached the issues. I think He would have just gone and hung out with people. Instead, my blog will be a place for the random, strange, bizarre, and occasionally clever words that flow through my mind to express themselves. I realized recently that my mind has a constant flow of words and poetic images that need a place to run free and dance. Holy Spirit whispers lyrics into my ears, and I can’t help but jot them down and present them before you humbly; a meager Feast of Babette. Sometimes, as above, the words are nothing more than wild and funny stories from this adventure of a life God has given me. Hopefully, some of them speak to you and draw you closer to the heart of the Lord.